This easy shrimp fried rice is restaurant-quality (or better!). Fresh or frozen shrimp are quickly stir-fried with garlic and onions. Add the cooked rice, a couple of eggs, frozen peas, plus my own special Thai sauce, and you have a fried rice recipe that is sure to please everyone, even your kids. A great way to use leftover rice - and leftover roasted chicken can also be added if you have some taking up space in the refrigerator. Add chili if you like it spicy. Yum! Fried Rice Cooking Tip: If you are using day-old rice (which makes for a much better fried rice), it will be lumpy and sticking together. To separate it, place the rice in a large bowl. Add 1 Tbsp. of vegetable oil. Now, using your fingers, mix the oil into the rice and separate the clumps, until the rice has returned into more or less individual grains. Stir the stir-fry sauce ingredients together. Set aside. Warm a wok or large frying pan over medium-high heat. Add 2 Tbsp. oil plus the garlic and onions. Stir-fry 30 seconds to 1 minute, or until fragrant. Add cooking wine and continue stir-frying another 2 minutes, or until onions begin to soften. Add the shrimp. 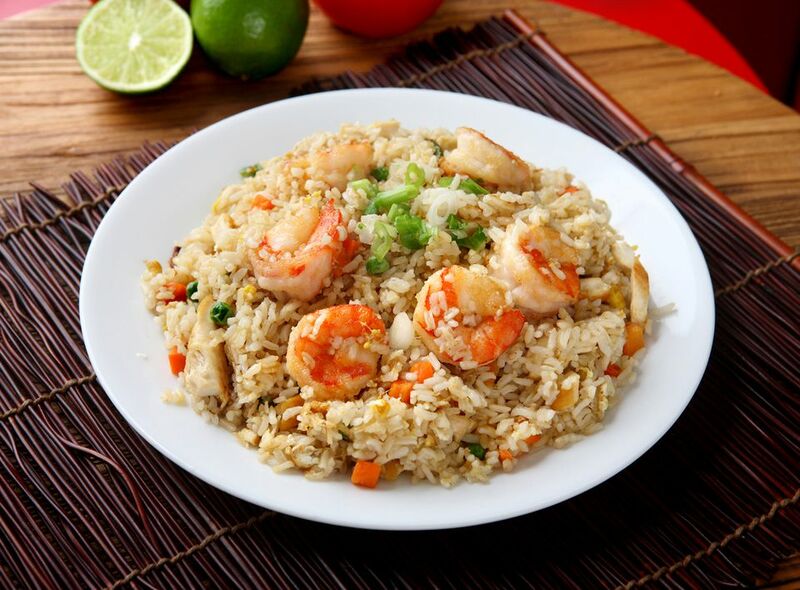 (If using cooked shrimp, add it later together with the rice). Stir-fry 2-3 minutes, or until shrimp have turned pink and plump. Push shrimp to the side of your pan. Add 1 tsp. more oil, then crack eggs into the pan. Quickly fry to scramble - about 1 minute. Keep the wok or frying pan hot for these last few steps (high heat). Add the rice, frozen peas and or mixed vegetables, and cashews (if using). Drizzle the stir-fry sauce over. Quickly begin "tossing" the rice in the wok/pan, using 2 utensils and a tossing-like motion (lifting from the bottom of the pan). Continue "stir-frying" in this way 3-7 minutes, or until rice and peas/vegetables are hot. Remove from heat and taste-test. For greater flavor, add a little more fish sauce until desired taste is achieved. If it tastes too salty, add a few squeezes of fresh lime or lemon juice. Top with green onion and serve hot straight from the wok/pan. For those who like it extra spicy, add fresh-cut chili, or serve with more Nam Prik Pao (Recipe) on the side. Enjoy!